I first met Marc LeMenestrel in the Hueco Tanks campground when I was 16 or 17 years old. I was on a bouldering trip with Katie Brown, her family, and Chris Sharma and his dad. We were all scrawny, psyched teenagers having the time of our lives in a bouldering mecca. Marc LeMenestrel was a bouldering icon at the time, establishing some of the most prestigious and proud lines out there. However, the personality trait that came out more than anything was his boyish exuberance for climbing. It just seemed liked he loved climbing and the lifestyle surrounding it more than anything else. I've recently been in the beautiful Fontainebleau forest where Marc is somewhat of a legend, having established some of the forest's most beautiful test-pieces. He was kind enough to answer some questions below. I hope you enjoy a look into his world as much as I do! I've now heard that you are back into sport climbing again, can you tell me what led to that? Marc: I am not back because I always have been a climber. For some time, I climbed less because I put energy elsewhere, but still at least once a week and often twice on average. The last years, I have been climbing much it is true! Living in Catalonia, I can't help it! I'm currently in Fontainebleau right now with my family. This place has such a rich history and it is neat to see what a huge part you played in that. How does it feel to you when you return to the forest? Are there certain problems that stand out to you and why? Marc: I have been spending so many weekends of the first part of life in the forest of Fontainebleau that it represents roots to me. Its beauty is unique and going back to it, like getting lost into the big ferns in search of new boulders, means coming home. I also have a special relation with sandstone. It is a texture where I feel I can really let go of myself and actually let my hands be taken by the rock itself. It is marvelous to experience this sensation. Has your perspective in the role you played here changed from when you were immersed in it to now? Marc: I now like to think of it from the point of view of the boulders themselves. Imagine what they have seen! And it is not finished! It seems that you have a great balance between climbing and the other parts of your life, for instance you have your PhD from INSEAD. What instilled in you the desire to have both? 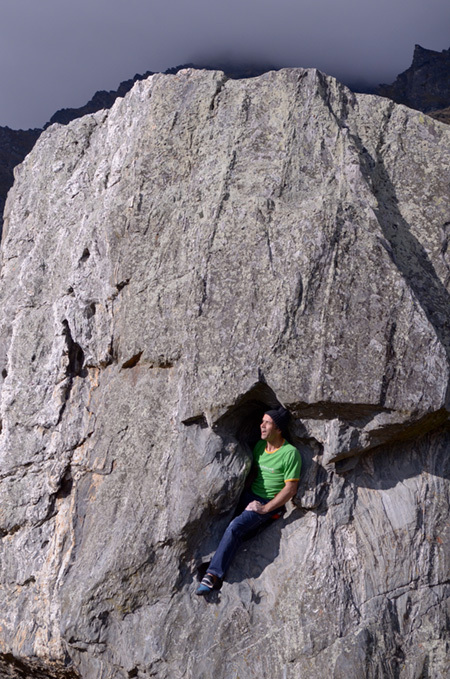 Marc: Climbing and thinking have been with me always. They are two main pillars upon which I have been developing myself. Was there a time that you considered pouring all of your energy into one or the other? What was it like to live in Fontainebleau? Did it help you to live so close to the area that you were developing? How was it for you when you moved away? Marc: We left Fontainebleau because we had the intuition that we had something to explore elsewhere too. But we have kept a house there. Tell me a little about climbing and your family? I know that your father climbed and so did your brother. Do your kids? How have you balance family life with climbing? Marc: My father has played a major role in my passion for climbing, and also for thinking. I have not totally reproduced the pattern of my father though. Although both of my daughters climb, only one is "compulsive" about it. It is an achievement somehow! More space for surprise and learning! For a good part of the past five years I've suffered from injuries that have forced me to take time off of climbing. Was there a time in climbing that was especially hard for you? If so, describe it and how did you deal with it? Marc: I am very grateful to my body. I wish I had fully realized earlier how much it is not the whole truth to think that I have a body. I am also my body, who has a mind. The conversation between the mind and the body constitutes an important part of being. Injuries can be seen as an ultimate way for the body to tell something to the mind, who sometimes doesn't listen. I am convinced that suffering is an invitation, sometimes harsh, for the mind to let go. What are the greatest challenges you have faced as a climber? Marc: The fear of myself. Who are some climbers that have played a significant role in your life? Why? Marc: I think all the climbers I went climbing with. Climbing is a social activity for me. The friendship that I experience around climbing is certainly part of the meaning of climbing. With nature and sport, friendship is one of the 3 equally important dimensions of climbing. Who are some of the younger climbers that inspire you? Why? What are your three favorite pieces of Metolius gear? Marc: The Crag Station, the Super Chalk and the harness. I have used a Metolius harness for decades and it provides for all what I need.